This is plate 20 from James Fergusson's 'Ancient Architecture in Hindoostan'. Kumbakonam in Tamil Nadu has many temples dedicated to Shiva and Vishnu, some of them famous for exquisite sculptures. The Nayaka dynasty ruled in Tamil Nadu from the 16th century to the 18th century. The Ramaswami Temple was built in the style of Nayaka architecture of the 16th century. Unusually for a temple in southern India, it is dedicated to Rama. It houses the seated figures of Rama, Sita and Hanuman, heroes of the epic Ramayana, with their attendants. 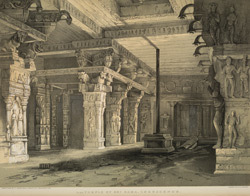 The spacious mandapa (hall) has pillars with delicate carving and some of the piers are sculpted with riders on rearing horses, maidens and courtiers.